The hero your chair deserves! Protect your chair just like you were the only hope in GOTHAM CITY™. Entertainment Earth Convention Exclusive! 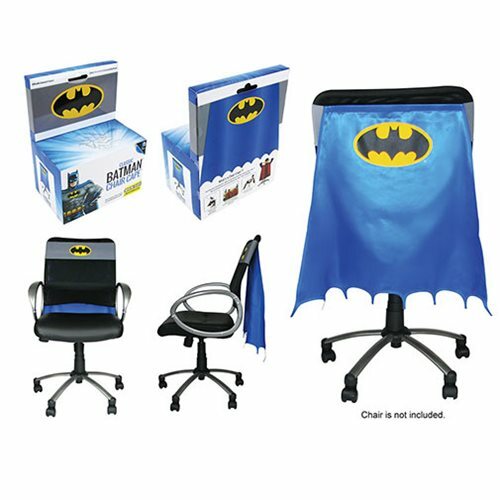 Be the hero your office deserves by transforming your chair with the Batman Classic Chair Cape™ - Convention Exclusive, the first patented product from Entertainment Earth. Made of high quality fabric materials, this Batman Classic Chair Cape™ is 24-inches long and includes an adjustable hook and loop based belt and strap that will fit most size chairs*. Send out the signal for all to see that The DARK KNIGHT™ not only rises, but he sits down too! The classic yellow and black BATMAN™ emblem is prominently displayed on the bold blue cape that also features the pointed arches made famous by the caped crusader. The same emblem is also visible on the gray adjustable chair strap. Limited to only 2,400 pieces, fans will want to catch this one-of-a-kind patented Chair Cape™ from Entertainment Earth before it disappears into the GOTHAM CITY™ night for good! Ages 14 and up.